← Whatever it is they’re peddling, it sure ain’t Physics! Yesterday I posted this reaction to the publication by the DfE of the GCSE_combined_science_content (copy taken – original link here). Others, including @alby and @hrogerson have written and commented about this as well. 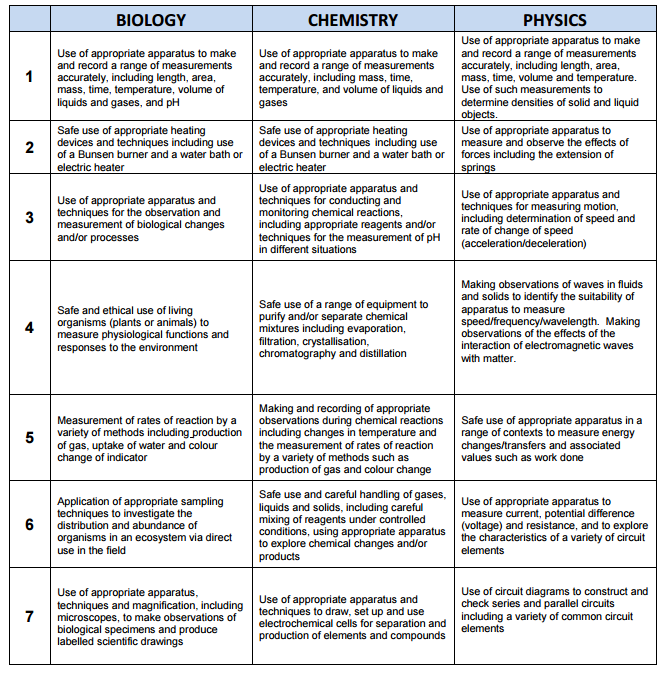 I thought it relevant to post some specific points (just from the physics section – which didn’t even appear correctly in the table of contents). Now some of these are more pedantic than others but there are essential aspects of the physics curriculum which are just wrong. What annoys me more than anything is the thought that this collection of subject specific requirements for exam boards to assess and therefore for teachers to teach has been put together in such a slap dash way. Perhaps I’m being unfair, I’m sure a lot of thought has gone into this extensive re-write of the GCSE curriculum, but for this final draft to contain the same mistakes as a year ago, even after correction tells me that the quality control on these important documents just isn’t good enough. It’s not rigorous, nor is it outstanding. In my opinion, for these mistakes to have happened in the first place meant the document definitely required improvement; but this final draft is inadequate. If you want to know what is wrong with this read my post explaining the problem. Why this is such an issue is that the DfE fixed this, but they clearly aren’t running any sort of version control on their documentation. For this really bad mistake to make it back in is astounding. This sentence is senseless. But lets add the missing to after that and ask what they want to assess. When we teach Hooke’s Law we talk about stretching the spring by applying a force (singular) to it. I think this needs clarification. The second part of this bullett [sic] point is a bit odd. Mathematical skill 1c is the use of ratio in converting units. In this case the ratio to convert between Nm and J is 1:1 as the joule is a unit given to the energy transferred or work done calculated by multiplying force times displacement along the line of force (dot product of two vectors) – this would give the units of newton metres but we use joules instead. The reason Nm is rarely used as a unit of energy is to avoid misunderstandings where a torque or turning force (also calculated by F × d but as a cross product, not a dot product – vectors Mr Gibb) is mistaken for an energy or vice versa. I must teach how fast the wind blows – is this using the Beaufort scale or miles per hour or knots? How very odd. Also the speed of light would be a good thing to add here. I’m not sure of the point of the transportation systems but hey. Acceleration in free fall on Earth due to the Earth’s gravitational field. Are we going for 10 or 9.81 m s s to be more rigorous? More on this later. The enclosed area of graphs is a graphical representation of the integral of the function of the line on the graph (thanks Newton). We integrate velocity with respect to time to get distance, but what happens when we integrate distance with respect to to time. I’ll tell you what happens: the last 40 minutes of Interstellar – i.e. nothing to do with Physics! Danger Will Robinson. The danger of reading the last phrase here and taking it literally is dangerous. Of course in a plug this would be a problem. But the accidental connection between the live and the earth in an appliance is what could save your life. If there is no connection between live and earth, but there is a connection between live and you, then you’re scuppered. Let’s deal with these two clangers in one shall we. Gravity force no! 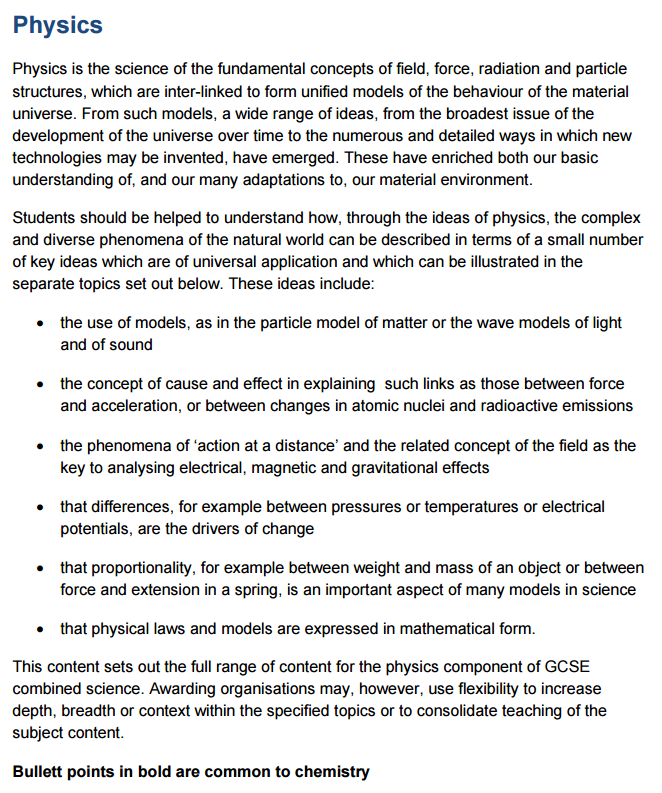 Let’s call it weight shall we, as that’s the main cognitively dissonant aspect of this whole section of physics at GCSE. Gravity constant (g) No! No! No! This should be the gravitational field strength at the Earth’s surface. It’s anything but constant! The gravitational constant is given the symbol G and is a very small number, and is a constant. It is not used in these equations. Just wrong, wrong, wrong! Charge flow is a rarely used term and just confuses matters especially in this second equation. Current is the rate of flow of charge. The charge flows in a current. Charge is measured in coulombs. Charge flow is kind of synonymous with current. It’s confusing. Charge will do. Why is this equation here, but the transformer equation from unit 3 of the current GCSE not included. [An answer my own question. The transformer equation is in the seperate sciences document.] This simply states that, assuming 100% efficiency in the transformer (never happens), power is conserved. Where’s the useful stuff, that shows how a transformer works. I think they’ve put the wrong equation down here. Here’s the practical list we’ve been awaiting with this final draft. The phrase appropriate apparatus pervades. Thanks for that. Very useful information – so glad for the wait. Now, DfE please remove this draft of the GCSE content and fix all the mistakes in it (again), then republish. Goodness me, you have identified some egregious errors in this document. I would embarrassed coming across these in a school scheme of work. It is unconscionable that they not only exist but — worse! — persist in an official government publication is shocking and shameful. It’s the lack of care that frustrates me. And I don’t understand who drafted it. Surely not subject specialists. I am really upset, to me it feels like the DfE are really unable to produce the world class curriculum they promised and don’t really care about the quality or content of what they produce. I hope they can sort this out. You would not normally say this, but thank goodness the exam boards stand between the DfE and what I have to teach. Yes. The only saving grace. But they have to stick more closely to this content this time. Hopefully not too closely. Keep your eye on this Alex, as I assume Ofqual will be assessing specs against these criteria in the next few weeks. And especially keep your eye on the required practical lists put forward by AOs, as commercial pressures will drive down practical requirements for fear of poor school resourcing. 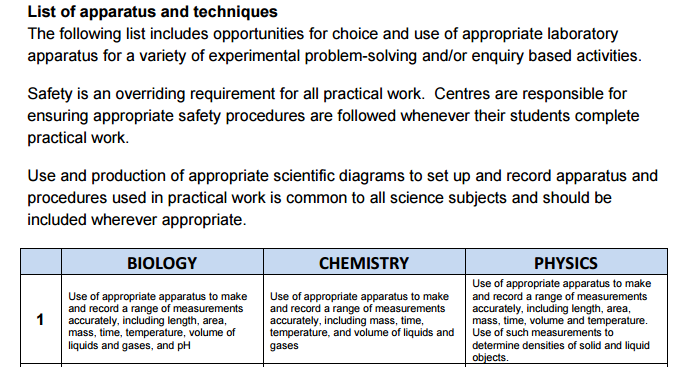 ‘Appropriate apparatus’ must be seen as appropriate to Y11 physics, even for those schools who choose for whatever reason to teach GCSE courses to Y9.